New Delhi : The handsome hunk of B-town 'Haider' star Shahid Kapoor who will tie a knot with a Delhi girl Mira Rajput on July 10. 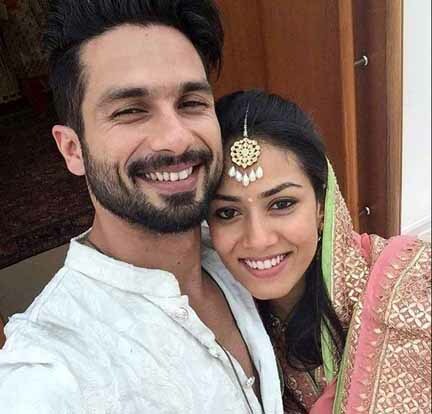 Today and yesterday their wedding Sangeet was held at Delhi in which both Shahid Kapoor and Mira Rajput dance together. Shahid Kapoor hugs Mira in the middle of the dance. However, the cute moment from the video is when Shahid gets up and hugs Mira after their dance. Not just that, but Sasha even kisses his would be wife and it is quite literally an adorable moment! Mira Rajput is a Delhi based girl who met with Shahid Kapoor at Radha Swami Satsang Beas. Today their marriage will be held at Chhatarpur farms which is near to Mira’s home in Delhi. Both were looking so happy yesterday. Mira were looking adorable and Shahid were looking super cool dude.